Natalie Bloom has been living a lie for almost a decade. But now she's breaking free. Natalie’s dream of owning a restaurant is about to come true. She’s found the perfect spot in a hip Brooklyn neighborhood and the perfect business partner - gorgeous Luke Hawker. Until she discovers things are not as they seem. All her money has been stolen and Luke was the only one who had access. 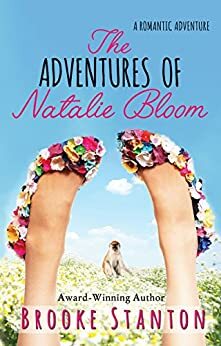 With her dreams crumbling around her, Natalie - alongside Max Euston (her friend and secret crush) - finds herself on a chase through the jungles of Costa Rica in a race against the clock to get the money back before it's too late. With twists, turns, lies, and deceit, Natalie soon realizes she doesn’t know who to trust...or to love. Can she unravel the mystery in time to save her dreams and her heart? I enjoyed reading about Catie Bloom, so I was more than ecstatic to read about Natalie. I figured it was time for that sister to shine! Although this is a stand alone book, I think readers would enjoy reading about Catie a little bit more. I say that, because Natalie takes us on a (what it feels like) a long journey to gain confidence in herself. That's my own personal preference though. If you liked the first book this one is even better! Join Natalie and Max as they race against time to find a lowlife creep and his sidekick. Through the beaches of Panama and the tropical jungles of Costa Rica Natalie learns who she can count on and how strong she is on her own. Caite also realizes just what a big role her sister plays in her life and how much she owes her (literally). Will Natalie finally get her restaurant? Only way to find out is by reading the book. 5.0 out of 5 starsNatalie in Central America? Natalie Bloom gets in trouble by just trying to do anything! I laughed at some of her highjinks and enjoyed all. Natalie's "partner" steals her money, the money she saved to start her new restaurant. He leaves town and when she finds out the adventure begins. A wonderful story of misadventure, misdirection, and mistaken stories. I received this free and am writing a review because I want others to enjoy the adventures of Natalie. This is the second book in a three book series about the Bloom sisters . In this book Natalie is about to get her dream and open her own restaurant , but she finds out that Luke her partner has taken all her money and taken off to Panama. Her friend Max who she was secretly in love with agrees to go with her . When they get there they go through so much trying to track Luke down. This is a great series and can't wait to read the last book . 4.0 out of 5 starsNot quite as fun as Catie's story! I liked Natalie's character better than Catie's in both books, but something about Catie's story felt more real to me. Maybe it was the chase after the guy who took her money, but it just didn't work as well for me. I'm definitely all about happy endings, and all's well that ends well. So the stage is set to see what happens in book three. I kind of felt like this was filler, and the main story for both characters is the secret that Catie and Natalie are hiding. I can''t wait to see how that plays out!